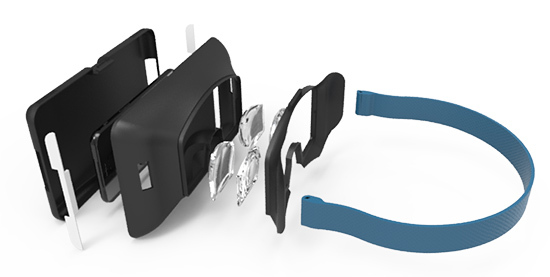 Delft University of Technology student D van den Oord created a 3D printed VR headset with 3D printed optics. Virtual reality headsets are a rapidly growing market, it allows users to be in a virtual world, which feels like they are actually there. The principles are based on the phenomenon called immersion, in this case your brain thinks that what you see is actually real. The effect is mainly created by three factors: stereoscopic 3D, head tracking and a wide field of view. The 3D effect is created by sending each eye an image of a virtual environment seen from a slightly different perspective. This tricks your brain into thinking the virtual scene your looking at actually has depth and gives you a good sense of scale. The head tracking is necessary to retain the feeling of immersion. In order for the virtual world to feel real it needs to react to your head movements. By rapidly changing the generated images based on your head location and rotation it can simulate the same feeling as looking around in a real environment and add to the effect of feeling present in the virtual environment. Lastly, a wide field of view is useful to help create the feeling of immersion even more. This is because your peripheral vision is less accurate and therefore more easily fooled into thinking something is real. Think for example of suddenly seeing a big spider in your peripheral vision, even though if it were fake and made of plastic it won’t be for a slight moment later when you get a better look at it from the center of your vision that you realise this. So the wider the field of view of a virtual reality headset is the more peripheral vision of your eyes is perceiving the virtual world giving a greater feeling of being immersed. To create this wide field of view the display that shows the virtual images either needs to be very big or be very close to your eyes. Since the former isn’t very practical the latter is often preferred in virtual reality headsets. But because of the limited near focus point (closest distance where your eyes are still able to focus) most people are not able to focus on a screen that close. So such a design requires lenses in order to create a magnified virtual image located at a distance where (almost) everyone’s eyes are able to focus at. Mostly this location is chosen to be at infinity. 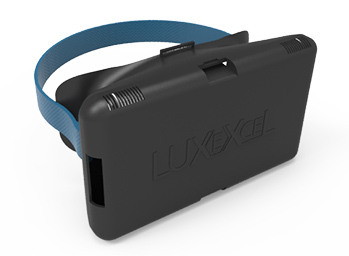 The Luxexcel 3D printed virtual reality headset will excel in giving the user the best possible virtual reality experience by maximising their field of view. This is done by using 3D printed lenses in the design. After analysing the user’s eye-socket shape, interpupillary distance and eye defects a customised optical design can be generated that gives the users the most optimal experience possible. This also makes it possible for people who wear glasses to use the headset without having to keep their glasses on. 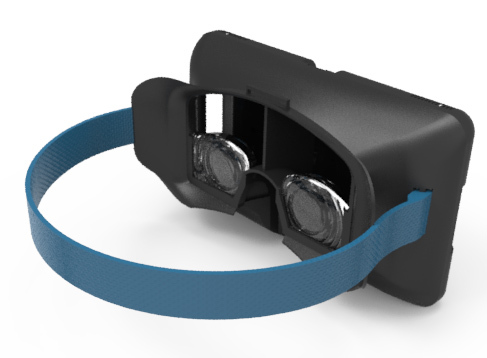 By using fresnel lenses on the eyes-side of the headset it is possible to create a very flat lens design, adding to that the fact that the lenses can be made in the shape of the user’s eye sockets it is possible for the lenses to be placed as close as possible to the user’s eyes. That enables the creation of the biggest possible field of view. In order to make the design available to the most possible people it is dependent on a smartphone. The smartphone will provide the stereoscopic 3D image and the head tracking that is required for a virtual reality experience. To support the biggest possible range of smartphones the design can be altered to fit smartphones from 3,5” up to 6”. Due to the ability to alter the design a case around the smartphone won’t matter for it being able to fit. Depending on the used smartphone it is possible to customise the lenses even further in order to make sure the screen will be exactly at the focal point and to ensure the virtual image will be of decent enough quality by limiting the minimum possible pixels per degree. To have this wide field of view filled solely with the virtual environment it is necessary to also have a big magnification of the image displayed on the screen and to be able to focus on the screen very close to your eyes. A shorter focal length of a lens results in a bigger magnification, so optimally if a smartphone has a high enough pixel density the shortest possible focal length would be mostly preferred to be able to fill the entire field of view of the human eyes. Although there will be a maximum when the entire field of view is filled, this will be impossible to reach while still keeping enough pixels per degree with the currently available smartphones. It’s very fast. Within a few days of finishing your lens design you are already able to test how it behaves in the real world. You get a lot of shape freedom and customisation possibilities for your design because it is 3D printed. The printed parts have a smooth finish and very good optical quality making it a viable competitor for traditionally made optical parts. Since virtual reality will eventually be an application every type of person might want to use it is necessary to have a design that works optimal for each different type of eyes possible. Custom 3D printed optics can give a much better result for some people than standardised traditionally manufactured optics. 3D printed optics allow for a lot of customization without the need for sliders or wheels to adjust a fixed set of lenses. Making it possible for designs to get more simplistic.